You feel it? A subtle shift in the weather, maybe? Two weeks ago, it happened again at Harvard University, where American-Israeli theoretical physicist Avi Loeb went on a 90-minute power-point jag titled “New Search Methods for Primitive and Intelligent Life Far from Earth.” Loeb’s presentation was a familiar rehash of a forum late last month at yet another staid institutional venue, the Library of Congress. Those guys devoted an entire two days to the same theme, “Preparing for Discovery: A Rational Approach to the Impact of Finding Microbial, Complex, or Intelligent Life Beyond Earth.” And this came just four months after a House subcommittee listened to a couple of SETI radioastronomers lobby for a resumption of funding to scan the cosmos for extraterrestrial radio signals. Obviously this isn't happening in a vacuum. There's an unending windfall of extrasolar planets — 4,875 logged at last count, 1,516 of those definitely confirmed — under scrutiny now in the Exoplanet Data Explorer’s burgeoning archives. Nowhere amid any of this lively badinage can these experts find any space for the 800-pound UFO gorilla so rigorously ignored by Conventional Wisdom. But hello, what’s this? Look what’s coming up at American University in Washington on Nov. 12 — a three-hour panel discussion called “UFOs: Encounters by Generals, Pilots and Government Officials.” And it’s an extension of an AU honors course — “Alien Contact: Science and Science Fiction,” taught by filmmaker/prof John Weiskopf. 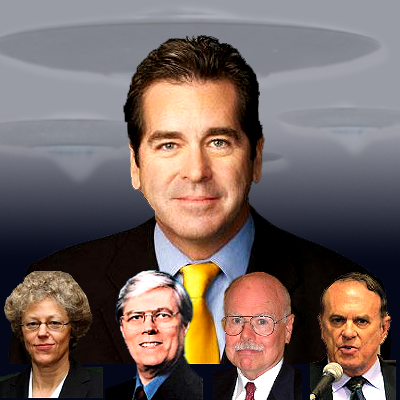 We’ve seen variations of this presentation before, based as it is on Leslie Kean’s bestseller UFOs: Generals, Pilots and Government Officials Go On the Record .Kean will be there, alongside retired NASA scientist Richard Haines and former USAF colonel Charles Halt. A nice twist is how the panel will be moderated by one of the brighter minds in the newsbiz, Miles O’Brien. A licensed pilot and award-winning journo, O’Brien wore several hats at CNN, including morning anchor and science/aerospace reporter. After management laid him off in real dumb move in December 2008, he went on to freelance for the likes of PBS, Discovery Science, and the National Science Foundation. To its credit, CNN recently brought him back to report on aviation. Immediately after the layoff six years ago, there was considerable paranoid cyberchatter about the five-part “In Search of Aliens” series he’d just filed for CNN, and about how it probably cost O’Brien his job. That was BS, of course, because there was no real groundbreaking in his reporting. In fact, one could easily argue he tried to do so much with so many topics, the whole presentation felt formulaic. A followup on MUFON’s exhaustive radar analysis of the Stephenville UFO earlier in 2008, for instance, would've made him the first mainstream network reporter to explore this hugely embarrassing PR disaster for the Air Force. But, alas, no mention of the data on CNN. Still, the fact that O’Brien chose to address The Great Taboo at all was a significant departure from the corporate apathy — or timidity — that too often characterizes prevailing attitudes. And one other departure of note: AU’s Weiskopf also decided to put Roswell on the docket. Overexposed and overhyped to the point of stigma, the 1947 Roswell Incident has been avoided by a lot of researchers lately. But Thomas Carey, co-author of 2009’s Witness To Roswell, has been invited to attend. "I was actually surprised -- it's quite an honor to be selected for this panel," says Carey, who's been researching and writing about the controversy for more than 20 years. "I'm looking forward to some good, tough questions and I'd hope people would come away with an appreciation for the fact that the Air Force spin on Roswell is absolutely ludicrous." At any rate, the exoplanets keep stacking up. Verification of wet, Earth-like habitats millions or even billions of years older than our own is a matter of time. And so is, inevitably, a responsible and ongoing conversation about The Great Taboo. Someday, our descendents will look back and wonder what the hell we were so afraid of.